[After James was martyred in Jerusalem] His disciples spirited away his body and … his head, placed his earthly remains in a boat, and set sail from Jaffa. In only seven days the ship, propelled miraculously by wind and waves, arrived at the coast of Galicia. As the ship neared the land, a horseman, riding beside the sea, was carried by his bolting horse into the waves, but instead of drowning, horse and rider came to the surface covered with scallop shells. Henceforth, the scallop shell became the symbol of St. James and the badge of the pilgrim to his shrine. During the Middle Ages, three holy places — Jerusalem, Rome, and Compostela, a remote Galician village in northwestern Spain — were visited by countless pilgrims from all over Europe, often in fulfillment of a lifelong dream. Compostela was the legendary burial place of St. James the Greater, Jacobus Major, the first apostle, and the first to die a martyr. 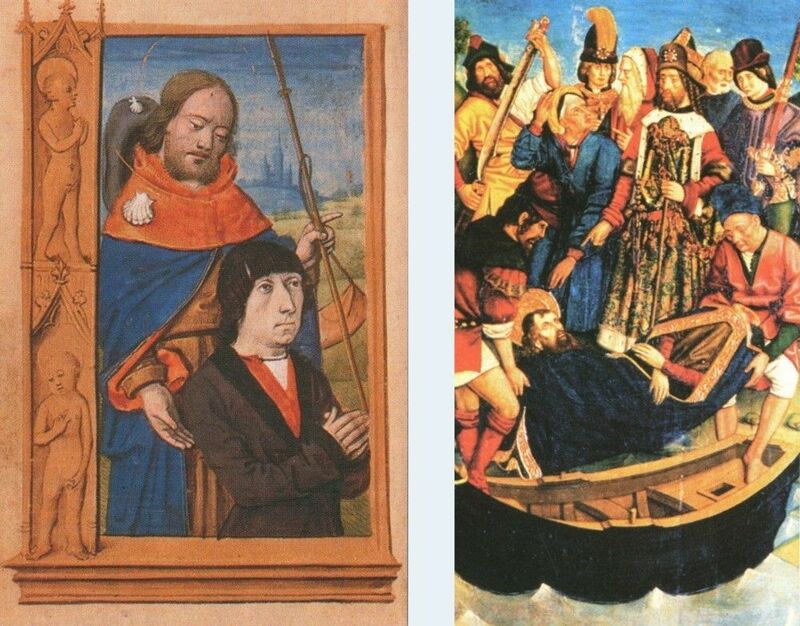 For medieval Spain, under Moslem siege, St. James became a heavenly champion and symbol of the Christian Reconquista. His power as a miracle worker was renowned, and visitors to his tomb sought both physical and spiritual healing, as they do to this day. About ninety percent of the music in Jacobus is plainchant for the Vigil and Feast of St. James (25 July) and for the Translation of his body from Palestine to Galicia (30 December). Most of it is specifically liturgical: hymns, antiphons, responsories, and versicles for the Divine Office and Mass propers and ordinaries. Many, if not most, of these were contrafacts (i.e., adapted from existing chants), such as the invitatory antiphons Venite omnes and Regem regum, the processional hymn Salve festa dies, and the antiphon Ad sepulcrum beati Iacobi. Other chants, like Agnus dei: Qui pius ac mitis, were expanded, or “troped” with additional text and music, and it was perhaps as an educational gesture that Greek, Hebrew, and Galician words were added to the ancient double-versicle “prosa” Alleluia: Gratulemur et letemur. Although they represent a mere ten percent of the music in Jacobus, the polyphonic works (nineteen for two voices, one for three voices) have received more attention from scholars than the plainchant has because they are among the earliest such pieces to have been written down. Some, like the conductus In hac die and Jacobe sancte tuum, are not strictly liturgical, but are perhaps meant to accompany a reader’s walk to the lectern. Several others are settings or tropes of the Benedicamus domino, a closing formula of the Office and Solemn Mass, such as Vox nostra resonet, Nostra phalanx, Ad superni regis, Gratulantes celebremus, and Congaudeant catholici. This last piece was originally notated in two voices, with a third voice added in a different hand — making it one of the earliest surviving three-voice pieces. Because this third voice creates many dissonances, some scholars say that only two voice parts should be sung at a time. We think, however, that it makes a very satisfying three-voice piece, just daring enough for an “avant-garde” work of its time. Most of the musical works in Jacobus are attributed in the manuscript to specific (usually French) authors — clerics and other notables, some famous and others unknown. Until recently it was thought that these attributions were fanciful, but research has verified many of them. For plainchant works based on existing melodies, these authors probably wrote new texts, often drawn from St. James’s copious miracle literature rather than from scripture. For polyphonic works, these authors may have been responsible for the music and text, or for the music alone. 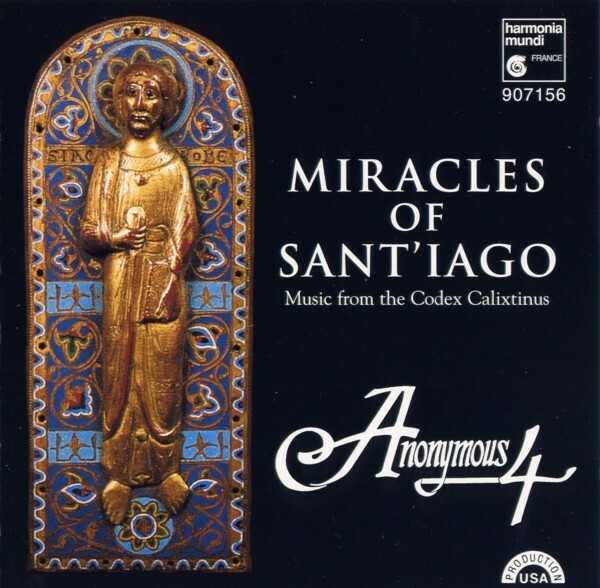 The greatest number of polyphonic settings by a single composer, including the monumental responsory O adiutor and its trope Portum in ultimo, are those of Bishop Ato of Troyes, who retired to Cluny in 1145 — just about the time when Jacobus was assembled. There are two distinct textures for the polyphonic works: a “discant” style, in which the two voice parts generally move together (as in the conductus and the Benedicamus tropes), and an “organal” style in which the upper voice part sings a rhapsodic melody against the long-held notes of a lower tenor voice based on a liturgical chant (as in O adiutor and the troped Kyrie: Cunctipotens). 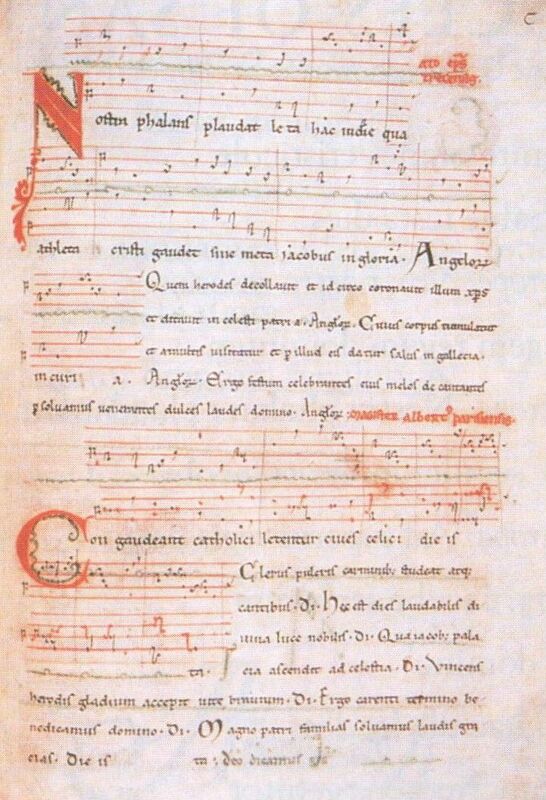 The plainchants most commonly set in this way are the soloists’ portions of the Gradual and Alleluia of the Mass, and the Matins Responsory of the Divine Office. In hindsight, it is possible to see this style, with its relatively simple textures and limited liturgical repertoire, as a primitive precursor of more sophisticated developments to come. But the polyphonic compositions that survive in Jacobus are representatives of a highly developed musical language. 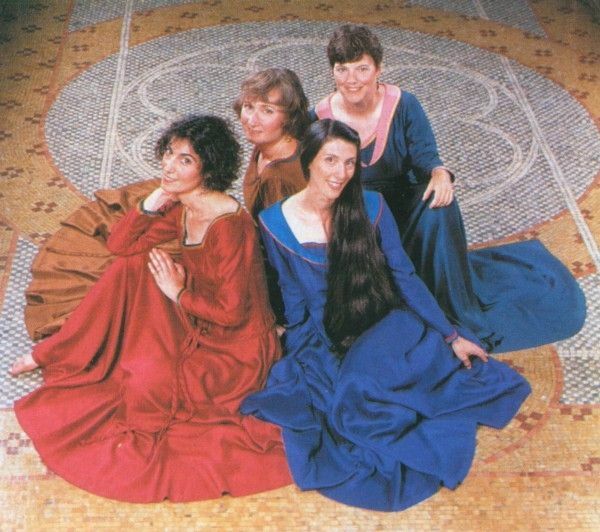 Just about a generation after the appearance of Jacobus, the basic elements of this language — its vocal textures and its repertoire — came together again in the first Notre Dame school of sacred polyphony, led by Leoninus. The notation in Jacobus is ambiguous as to rhythm and meter, as well as to alignment of pitches between the voice parts in the polyphony. Scholars have proposed a variety of rhythmic solutions for the polyphony and the non-liturgical songs, ranging from an unmeasured chant-like style to strictly regular “modal” rhythm. Instead of adhering to any previously existing theory, we have come to our rhythmic interpretations by considering not only melodic, harmonic, and notational patterns, but also the nature and poetic structure of the texts themselves. In imitation of contemporary instrumental practice, we have occasionally added vocal drones as well. 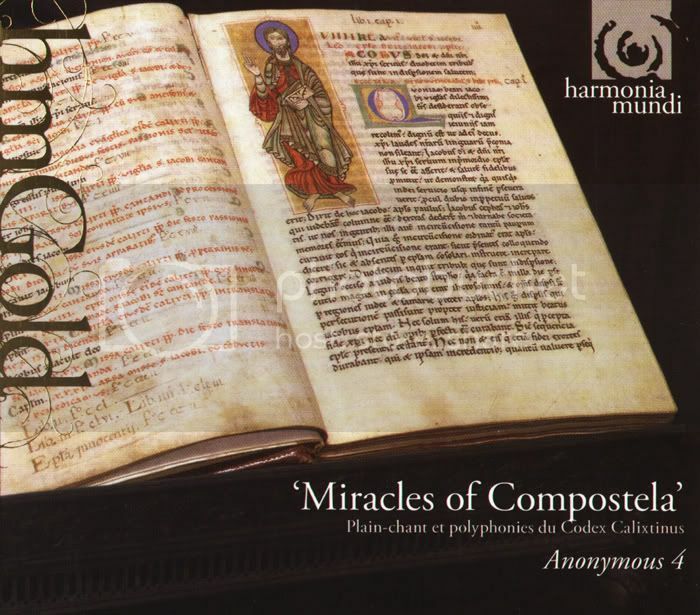 As our guiding principle we have tried to be true to the infectiously joyful and exuberant melody that pervades this remarkable collection, made for and performed by the young treble voices of a medieval French grammar school. * Christopher Hohler, “A Note on Jacobus”, Journal of the Warburg and Courtauld Institutes, XXXV (1972), pp. 31-80.